All submissions uploaded to the manuscript evaluation system will be investigated in weekly meetings by the Editorial Board for the control of their scientific contents. Individual views of board members are received and the final decision on the submission is given by the Editor in chief. Submissions with scientific contents are assigned a section editor for further processes. Section editors send a manuscript as soon as possible to 2 reviewers with a PhD degree at the least for a review request. The reviewers are asked to inform the section editors in 5 days to inform the section editors about their decisions (accept or refuse to review) on evaluation of the manuscripts. Section editors assign new reviewers for those who refuses the review request or who does not respond in 7 days. Reviewers accepting the manuscripts for evaluation complete their review tasks in 20 days and send their review reports to section editors with which they reject the manuscript or ask for a resubmission after revision. TUJNS applys double blind review process. Section editors make a decision considering the reviewers’ reports and inform the Editor-in-Chief the decision. Than Editor-in-Chief give the final decision about the manuscript and inform the author(s) about the decision. All submissions to Trakya University Journal of Natural Sciences should be original studies. The authors are encouraged to follow the ethic guidelines of Committee on Publication Ethics (COPE). All submissions undergo a plagiarism control by the Editor using the web based iThenticate program to confirm their originality as a natural necessity to keeping rights of the authors and to meet the journals aditorial responsibilities. The editor considers the report of the plagiarism control in terms of not only numerical values of the overlap bu also in other ethical points that authors should pay attention in citations, and then makes a decision to move the manuscript in further evaluation steps or not. For more information about TUJNS Ethical principles click here. Trakya University Journal of Natural Sciences follows the below authorship criteria of Committee on Publication Ethics (COPE) and every corresponding author should fill the Authorship contribution form based on these criteria of COPE. 3. Have seen and approved the final version of the paper and agreed to its submission for publication. All persons who made substantial contributions to the work reported in the manuscript (such as technical help, writing and editing assistance, general support) but who do not meet the criteria for authorship must not be listed as an author, but should be acknowledged in the “Acknowledgements” section after their written permission to be named has been obtained. The corresponding author should ensure that all appropriate coauthors (according to the above definition) and no inappropriate coauthors are included in the author list and verify that all coauthors have seen and approved the final version of the manuscript and agreed to its submission for publication. 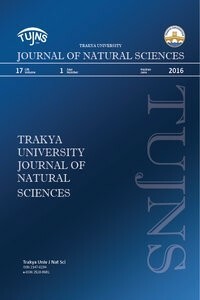 Trakya University Journal of Natural Sciences, is published twice a year in April and in October and includes theoretical and experimental articles in the fields of Biology, Biotechnology, Environmental Sciences, Biochemistry, Biophysics, Fisheries Sciences, Agriculture, Veterinary and Animal Sciences, Forestry, Genetics, Food Sciences and Basic Medicine Sciences. Original studies, research notes, reviews, technical notes, letters to the Editor and book reviews can be published in the journal. The publishing language for all articles in the journal is English. On the other hand, authors are required to provide a Turkish abstract also. The Turkish version of the abstract will be supply by the journal for foreign authors. Abstracts should include introduction, material and methods, results and discussion sections in summary. The authors should pay attention to research and publication ethics Committee on Publication Ethics (COPE) in preparation of their manuscripts before submission by considering national and international valid ethics. An approval of Ethics and Animal Welfare Committee is mandatory for submissions based on experimental animals and this approval should be provided during submission of the manuscripts. Articles which have not been published elsewhere previously and whose copyright has not been given to anywhere else should be submitted. All responsibilities related to published articles in Trakya University Journal of Natural Sciences belong to the authors. Articles should be submitted on the web through http://dergipark.gov.tr/trkjnat and all submissions should be performed online. Authors, who are already a member of the DergiPark system, can enter in the login section using their “user name” and “password“ to submit their articles. Authors entering the DergiPark system for the first time to submit an article will enter in the “REGISTER” section to submit their articles. Articles should be submitted to the Journal using MS Word preparing 12 points Times New Roman font and 1.5 raw spacing. Author names and contact info must be in first page, article must continue in second page without author names and contact info. Whole article should have numbered with line number restarting each page. The author's name must not be specified any academic titles. If studies supported by a foundation, this support should have been written in the acknowledgement section. Authors: The name(s) of the author(s) should not be abbreviated and must be written under the title one by one, with surnames in capital letters. Address(es) should be written in full. Corresponding authors in multiple authored submissions should be indicated, and the address and e-mail of the corresponding author should be written just under the author(s) list. No other information about the manuscript should be included in this page. The main manuscript text should start with the following new page and should not include any author-contact information. Title: Should be short and explanatory and written in capital letters and centered. Abstract and keywords: Turkish and English abstracts should not exceed 250 words. “Keywords” should be written under the abstract in small letters and all keywords should be written using a comma after all. Keywords should not be replica of the title words, if it is not obligatory. Abstract should begin “Abstract” word from the left side of the page. The main and sub headers (if present) should not be numbered. Introduction: The aim of the submitted and history of the previous studies should be indicated in this section. SI (Systeme International) system and abbreviation should be used in the article. Other abbreviations- should be explained once in their first appearance in the text. No “.” sign should be used after abbreviations except those used at the end of a sentence (…the determined distance is 45 m. Therefore, …). Material and Method: If the submitted study is experimental, methods of the experiments should be given in detail. The method(s) used in the article should be descriptive for others to repeat. If a widely known experimental method is used, the method does not need to be explained in detail. In this situation, indicating only the name of the experimental method or citing the study who used the method for the first time will be enough. Results: Obtained results should be given in this section without any comment. Results can be explained with tables, figures or graphics, if necessary. Discussion: Results must be discussed, but unnecessary duplications should be avoided. In this section, rather than giving literature data, authors should focus on their results considering similarities and differences with and between previously conducted researches, and should discuss possible reasons of similarities and differences. The contribution to science and importance of the obtained results should also be mentioned as much as possible in this section. Acknowledgements: Should be as short as possible. Thanks are usually made to institutions or individuals who support the study or to experts who reviewed the article before submitting to the journal. Acknowledgement section should be given before the references section in a separate header. References: Unpublished information should not be given as a reference (examples of unpublished references: articles in preparation or submitted somewhere, unpublished data or observations, data obtained based on interviews with individuals, reports, lecture notes, seminars, etc.). However, thesis completed and signed by a jury and articles with DOI numbers given can be used as reference. References should be given at the end of the text, sorted alphabetically by author’s surname and should be given with numbering. You can download the Endnote style of TUJNS from here. Or you can fallow the instruction below. Articles: Surname of author, first letter of author’s first name, publication year, article title, the name of the journal, volume, issue, page numbers. Journal name is written in italics. Surname, N. Year. Article title (First letter of all words small). Whole name of journal, Volume (Issue): page range. Aybeke, M. 2016. The detection of appropriate organic fertilizer and mycorrhizal method enhancing salt stress tolerance in rice (Oryza sativa L.) under field conditions. Trakya University Journal of Natural Sciences, 17(1): 17-27. Surname1, N1. & Surname2, N2. Year. Article title (First letter of all words small). Whole name of journal, Volume (Issue): page range. Dursun, A. & Fent, M. 2016. Contributions to The Cicadomorpha and Fulgoromorpha (Hemiptera) fauna of Turkish Thrace region. Trakya University Journal of Natural Sciences, 17(2): 123-128. Surname1, N1., Surname2, N2. & Surname3, N. Year. Article title (First letter of words small). Whole name of journal, Volume (Issue): page range. Becenen, N., Uluçam, G. & Altun, Ö. 2017. Synthesis and antimicrobial activity of iron cyclohexanedicarboxylic acid and examination of pH effect on extraction in water and organic phases.Trakya University Journal of Natural Sciences, 18(1): 1-7. Book: Surname of author, first letter of author’s first name, Year. Book title (name of translator or book editor if present), volume, edition number, press, city, page number. Surname, N. Year. Book Title (First letter of words small and italic), volume, edition number, press, city, page number. Czechowski, W., Radchenko, A., Czechowska, W. & Vepsäläinen, K. 2012. The ants of Poland with reference to the myrmecofauna of Europe. Museum and Institute of Zoology PAS, Warsaw, 496 pp. Book Section: Surname of author, first letter of the author’s first name, Year. Section name, page range. In: (Editor of Book, Book title, press, city, page number). Jansson, A. 1995. Family Corixidae Leach, 1815—The water boatmen. Pp. 26–56. In: Aukema, B. & Rieger, Ch. (eds) Catalogue of the Heteroptera of the Palaearctic Region. Vol. 1. Enicocephalomorpha, Dipsocoromorpha, Nepomorpha, Gerromor­phaand Leptopodomorpha. The Netherlands Entomological Society, Amsterdam, xxvi + 222 pp. Congress, Symposium: Surname, N. Year. Presentation title (first letters of all words small), page range. Name of Congress/Symposium, Date (day range and month), place. Bracko, G., Kiran, K., & Karaman, C. 2015. The ant fauna of Greek Thrace, 33-34. Paper presented at the 6th Central European Workshop of Myrmecology, 24-27 July, Debrecen-Hungary. Internet: If any information is taken from an internet source (articles published in journals and taken from internet excluded), internet address should be written in full in references section and access date should be indicated. Surname, N. Year. Name of study (First letter of words small) (Web page: http://www......) (Date accessed: 12.08.2009). Hatch, S. 2001. Student sperception of online education. Multimedia CBT Systems. (Web page: http://www.scu.edu.au/schools/sawd/moconf/papers2001/hatch.pdf) (Date accessed: 12.08.2009). References within the text should not be numbered and indicated as in the following examples. Graphics and tables: All photos, pictures, drawings and graphics except tables should be indicated as Figures. Pictures, figures and graphics should be clear and ready to print with offset technique. The places of all tables and figures should be indicated in the text. All tables and figures should be numbered within the text respectively (Table 1, Fig. 1). Figure numbers and legends are written below the figures, table numbers and legends are written above the tables. All figures (all pictures, drawings and graphics except table) should also be uploaded to the system separately with 300dpi resolution at least as .tif file using the figure numbers in the files name. Submitted articles are subjected to prior review by the Editorial Board. Editorial Board has the right to reject the articles which are considered of low quality for publish or those which are insufficiently prepared according to the author guidelines. The articles accepted for consideration for evaluation will be sent to two different referees. Editorial Board decides to accept or reject the submissions for publication by taking into account the reports of referees. All kinds of exploitation doubts and complaints about manuscripts, either published or in publication process, are evaluated by the Editorial Board. The Editorial Board strictly follows the directives of COPE (Committee on Publication Ethics) during the evaluations. An ombudsman who has no connection with the parts in any stage of the complaint is appointed and a decision is made. Complaints can be sent to the editor in chief by sending an e-mail to tujns@trakya.edu.tr.